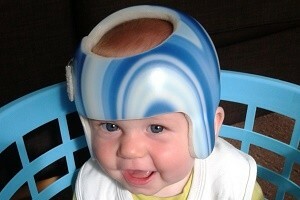 Finding out that your baby has flat head syndrome can be an emotional and financial roller coaster ride. Treatment is only provided by the NHS in exceptional cases, with the majority of parents having to raise the funds themselves. Coby’s inspirational plagiocephaly story serves as a reminder not to give up – even when the odds seem to be stacked against you. Andria Donnison first voiced her concerns to her health visitor when Coby was between two and three months old, but was assured that his head shape would correct itself once he started rolling over. Local businesses in Bridlington rallied together to donate funds and raffle prizes for Coby’s treatment. He became quite the local celebrity and his blue helmet and big smile earned him a great deal of attention during the weeks and months that followed. Both Coby’s family and his orthotist Sandie Waddell were delighted with the outcome. Concerned about your baby’s head shape? Technology in Motion can provide you with a free, no obligation appointment to assess the severity of the flattening and advise you on the best possible course of action. Call 0330 100 1800 or fill in our contact form to enquire.